As mentioned, the dimensions of the D3300’s polycarbonate body differ fractionally to those of the D3200 – but it’s a matter of millimetres: the new camera is 1mm thinner, 1mm shallower and 2mm taller. It is 25g lighter, but in real terms it’s all so marginal as to be virtually unnoticeable. 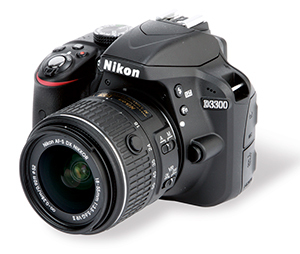 What does make a difference is the new kit lens Nikon has introduced to accompany the D3300. It features a collapsible design similar to that of Nikon’s 1-system lenses. By collapsing the barrel of the lens in on itself, Nikon claims the new 18-55mm f/3.5-5.6G VR II kit lens is 30% smaller and 25% lighter than its predecessor. So when carrying this camera and lens combination, the reduced weight is something you certainly do notice. As such, the D3300 may also be small enough to be tempt those who would otherwise opt for a compact system camera, especially considering the camera’s high resolution. Being an entry-level DSLR, buttons and dials are kept to a minimum on the D3300. Nikon has kept to its tried-and-tested arrangement, with the menu and playback buttons to the left of the LCD screen where they can be easily pressed by the thumb of the left hand, and the navigational controls on the right within reach of the thumb of the right hand. It’s a system that works well for quickly navigating the on-screen menus. 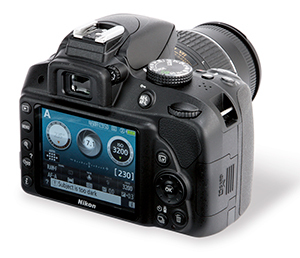 There are very few buttons that provide direct access to exposure and shooting settings. On the rear of the camera is one that changes the shooting rate, while on the top-plate next to the shutter button is the control for exposure compensation. On the front left of the camera (as you are using it), there is a function button that by default enables quick access to ISO sensitivity, and just above that is a single button to pop up the flash and change the flash settings. All the other most commonly used image settings are accessed by pressing the info button on the rear of the camera. This brings up an on-screen quick menu that provides access to features such as raw and JPEG shooting, different metering and AF modes, white balance and image style – in short, everything you might want to change quickly in between shots. For those who are just starting out with their photography, the rear display also shows graphics that represent the aperture, shutter and sensitivity. The two latter graphics rotate like a dial, helping to relate the settings to those of a more traditional film camera, whereas the aperture graphic actually changes the size of the displayed aperture. This is really useful for quickly communicating to beginners the effect that changing the aperture setting has on the aperture itself. In addition, the ‘?’ button can be held down when on any of the settings to bring up a brief explanation of what that feature does. It is another useful educational feature for those who are still learning about photography, and it is like having a basic instruction manual built into the camera.